Unfunny and stupid, this movie was clearly just an excuse to get these guys together, even with an terrible script and lousy ideas. Grown Ups is a pretty lousy movie, which is something that shouldn’t really surprise anyone at all. Adam sandler hasn’t been funny in years. In fact, I’m pretty sure his last great movie was in 1998, which is well over a decade ago. That movie was the wedding singer. Before that, he had Billy Madison and Happy Gilmore, all terrific fun. There’s no doubt that even his best movies (these three) were stupid, but at least they had catchy plots or humorous characters. But after that sandler went the extreme route with his characters, making them one dimensional cartoons with movies like the waterboy and little nicky. And by the time he was done with that phase, he had lost it. Whatever he had at the start of his movie career was long gone. He had the first three and that was it. A Number of filmmakers and stars do excellent work in threes. Like kevin smith with clerks, mallrats, and chasing amy, his “new Jersey trilogy.” For adam sandler, his trilogy was over and done after his friend film. But for “grown ups,” things looked like they might be different. At least like they had more potential than usual. that’s because this movie didn’t look like it would be all about a one joke premise, like the typical sandler movie. This wasn’t two gay guys faking a marriage to escape a legal loophole, or a remote control that lets you skip through time. This was a movie about the great nineties cast members of saturday night live. Sandler was just one of the bunch. There was also chris rock, david spade, and rob sneider, all on hand in this movie. And then kevin james was brought in to fill in the role that would have gone to chris farley. What a different movie this would have been if farley had still been alive today. Unlike James, chris farley actually had a repore with these guys, especially spade. And he wasn’t afraid to make a fool of himself. In this movie, James has only one real farley moment, where he swings from a rope and ends up slamming into a tree and then crashing down a hill. It’s a funny moment, but farley would have filled the movie with moments like this, just like he did for tommy boy and black sheep. The plot for the movie is pretty elementary. these guys were all friends in elementary school and played on a basketball team together. now their coach dies, and they come together for the funeral. Basically it’s the comedy version of the big chill. And the guys come with their families and stay in a cabin for the weekend. And the plot ends there. This movie was made solely to get these guys all together into one film. It wasn’t made because there was actually a script or premise there. The desperation sizzles out of every attempt at a joke. There are fart jokes to be sure, which is something american comedy has long moved past by now. but that’s the problem with this movie and even with these guys. their time and their brand of comedy is long over. We’ve gone through two major comedic over haLLS since them. These guys were funny about a decade ago. And that’s being kind. they dominated the nineties, back when waynes world was something worthwhile and phil hartman and david spade were doing worthwhile television. They emerged on saturday night live in the early ninties, started making movies in the mid-nineties, and had petered out by the end of the nineties. Only sandler really survived as a movie star, and even his movies got worse and worse as he went on. And the comedic market shifted away from these guys who were just plain stupid and over to the slacker generation. That was the Frat pack, the group of six guys spear headed by director todd phillips. the guys were vince vaughn, ben stiller, owen wilson, luke wilson, jack black, and will ferrell. In particular, ferrell was an interesting case because he was the generation of saturday night livers that came after the sandler-spade age. And ferrell was also the one to welcome in the brand of comedy that followed his group. When he made anchorman, he was really launching the cinematic careers of steve carrell and paul rudd who went on to kickstart the apatow gang generation when they starred in the forty year old virgin. All of a sudden we had seth rogen as the ultimate slacker, which led to guys like jason segal and jonah hill. And from saturday night live we started being introduced to bill hader and kristin wigg, both in the apatow movie knocked up, both the third saturday night live generation since the early nineties. Compared to the apatow generation, the sandler boys are like dinosaurs. It’s not that they’re old men or anything, but just representative of a forgotten brand of comedy that society has moved past. These guys were from the time of jim carrey and when was the last time he had anything relevant? 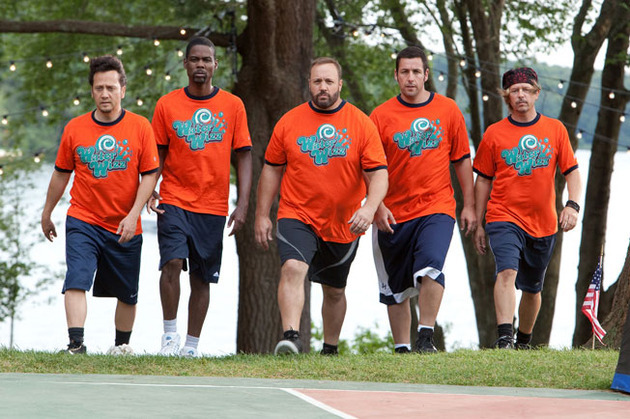 Comedy is probably the most short lived of any brand of acting, and these older saturday night livers prove it with the movie grown ups. the reason why this review has not focussed much on that movie is simply because the filmmakers themselves did not focus on it much. the jokes are from those of a simpleton. rob shneider sings a song at the funeral ceremony in a high voice and gets down on his knees as he sings. you can’t compare that to jonah hill miming sexual situations behind a girl’s back in cooking class in superbad. 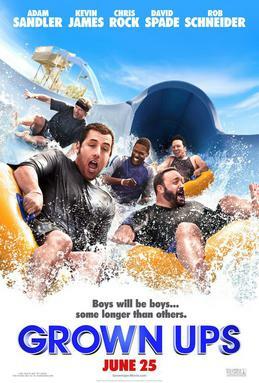 Grown ups refuses to get dirty in the same way as the apatow movies and that’s one of the bigger problems with the film. For this movie, getting dirty is looking at hot girls and pretending not to be looking. Apatow’s generation would be talking about the nasty things that these guys would want to do to these girls. If this movie and these actors wanted to stay relevant, they should have taken a page from that book and made their movie dirtier. They should have brought in judd apatow to help them out, and the first thing he would have told them was that they needed some kind of quest for romance. their needed to be at least one female character who was just as important to the movie as the male characters. But there isn’t. Instead, the guys bring their wives, but the wives disappear into the background as the men go out doing stupid things with each other all movie long. there’s the shooting an arrow into the air, the water park hanging from a zip line, and the cliched end of the movie basketball game against their old rivals. It’s all just filler and fluff to give the guys a reason to do things together. the movie has nothing of any value to offer and is completely unfunny. these guys and their humor is long over, and the biggest problem is that they refuse to acknowledge that and don’t even make an attempt to change up their ways for the new generation.